The 2018 calendar year Form 1098-T data will be made available in January 31, 2019. In previous years, your Form 1098-T included a figure in Box 2 that represented the qualified tuition and related expenses (QTRE) we billed to your student account for the calendar (tax) year. Due to a change to institutional reporting requirements under federal law, beginning with tax year 2018, we will report in Box 1 the amount of qualified tuition and related expenses you paid during the year. 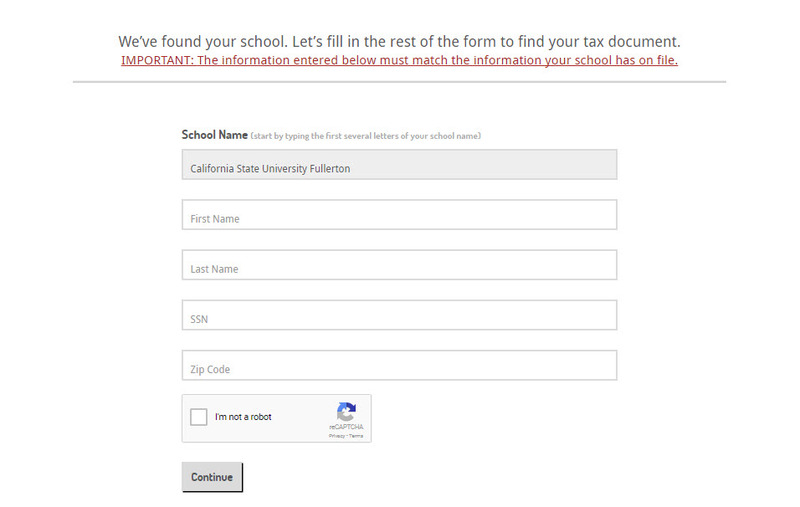 California State University, Fullerton is unable to provide you with individual tax advice, but should you have questions, you should seek the counsel of an informed tax preparer or adviser. Payments 12/20/2018 Mail payments posted to student accounts on or before December 20, 2018, will be part of the 2018 tax year. Payments posted AFTER December 20, 2018, will be part of the 2019 tax year. Postmarked dates are not accepted. Flywire (International) Payments 12/19/2018 Flywire payments posted to student accounts on or before December 19, 2018, will be part of the 2018 tax year. Payments posted AFTER December 19, 2018, will be part of the 2019 tax year. Online Payments (Student Portal) 12/31/2018 Credit card and electronic check (ACH) payments made online by 10:30 PM December 31, 2018, will be part of the 2018 tax year. Payments posted AFTER December 31, 2018, 10:30 PM will be part of the 2019 tax year. If you would like to create a profile to access your tax document, the instructions to create a profile, as well as your Heartland Key, are included in the email Heartland ECSI sends to you when your tax statement is ready. We have included those instructions below for your reference. In the event that you do not have the email containing your Heartland Key, please contact Heartland ECSI's Customer Service Department at 1-866-428-1098 or via LiveChat from the Heartland ECSI student website. You will need to provide basic information to authenticate your identity, and the Heartland Key will be provided. You can access your tax form without creating a profile by clicking the tax document retrieval link above. Visit the Heartland ECSI Form 1098-T Look-up page. Search for California State University Fullerton in the School Name search bar. Highlight California State University Fullerton by clicking your selection. Enter your personal information on the secured page. If you would like to view the official document, click on "View/Print Statement" and a new window will open. Make sure your pop-up blockers are disabled. Use the correct Zip Code for the year you are requesting. You can access your 1098-T statement quickly and easily by visiting the Heartland ECSI Website using one of the following methods. If you already have a profile with Heartland ECSI, please sign in. If you have not yet connected your tax statements to your account, you will need to connect them using your Heartland Key. Simply click on the "Connect An Account" button and enter your tax statement Heartland Key. If you have not registered for an account, click on the Sign In or Register button in the upper right side of the page. Complete the registration section to create your profile and then connect your tax account by entering your Heartland Key. 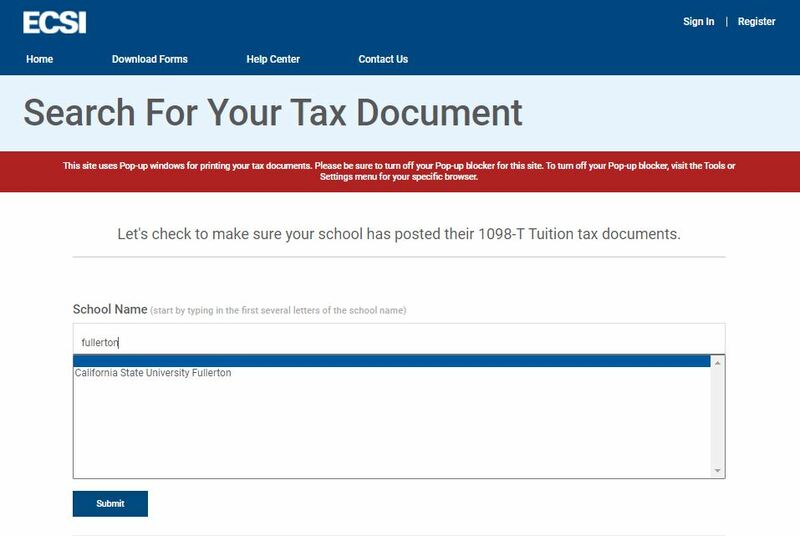 If you have any general non-tax specific questions about your Form 1098-T, email student1098t@fullerton.edu for more information. Please include your full name and CWID number so that we access your account and better assist you. Due to a change to institutional reporting requirements under federal law, beginning with tax year 2018, we will report in Box 1 the amount of qualified tuition and related expense you paid during the calendar year. It is each student’s individual responsibility to maintain all records and documents supporting all educational credits and deductions taken on their personal tax returns. The Form 1098-T provided by CSUF does not serve as full documentation for any educational credit or deduction claimed. Amounts reported on the Form 1098-T must be substantiated by proper payment and scholarship award documentation and evidence (i.e. canceled checks, credit card receipts, scholarship award letters, bank statements, etc.). Upon review of such documentation, students may find additional eligible educational expenses not reported on the Form 1098-T (i.e. textbooks, on-campus housing payments, etc.). Please refer to IRS Publication 970, Tax Benefits for Higher Education , for further guidance. To update your campus records with your correct SSN or ITIN, please complete the IRS W-9s Form and submit it to the Registration & Records office, LH-114B. Failure to comply with this requirement may result in a $50 penalty to you, assessed on each incorrect document by the Internal Revenue Service under Code § 6723. Completed IRS W-9S Forms should not be emailed, put in a drop box, or sent via U.S. Postal mail. If you have any questions regarding your account or need further information, please contact their Client Support Team online via TeamSupport, email us at clientsupport@ecsi.net, or call Heartland ECSI at 1-800-437-6931. Form 1098-T information for the 2005 through 2018 tax years are also available through ECSI. The 2018 calendar year Form 1098-T data available on January 31, 2019. What do the 2018 Form 1098-T Boxes Contain? Student's Taxpayer identification number - For your protection, this form may show only the last four digits of your social security number (SSN). Individual taxpayer identification number (ITIN), or adoption taxpayer identification number (ATIN). However, the issuer has reported your complete identification number to the IRS and, where applicable, to state and/or local governments. A TIN Solicitation Checkbox is checked if we solicited you in the appropriate manner at least once during the year regarding providing a SSN or ITIN for processing and filing your IRS Form 1098-T regardless if a SSN or ITIN (aka Taxpayer Identification Number (TIN)) was or was not provided to the CSUF prior to tax form issuance. Account number - May show an account or other unique number the filer assigned to distinguish your account. For CSUF, your Campuswide Identification (CWID) number is shown in this box. Box 1 - Shows the total payments received in 2018 from any source for qualified tuition and related expenses less any reimbursements or refunds made during 2018 that relate to those payments received during 2018. Box 2 - For tax year 2018, all institutions must report amounts paid in Box 1. Box 2 can no longer be used and will be greyed out. Box 3 - This box is checked because CSUF changed its Box 2 reporting method. Box 4 - Shows any adjustment made for a prior year for qualified tuition and related expenses that were reported on a prior year Form 1098-T. This amount may reduce any allowable education credit that you claimed for the prior year (may result in an increase in tax liability for the year of the refund). See “recapture” in the index to IRS Publication 970 to report a reduction in your education credit or tuition and fees deduction. For example, if you paid Spring 2018 registration fees when due in Fall 2018, "qualified tuition" for the Spring 2018 semester would have been reported on your 1098-T for 2018. If you subsequently received a refund of Spring 2018 registration fees in February 2018, the amount refunded would be reported in Form 1098-T Box 4 for the 2018 tax calendar year. Box 5 - Shows the total of all scholarships or grants (educational assistance) administered and processed by CSUF. Educational assistance amounts reported are ones applied against your student account during the tax calendar year (January 1st to December 31st). Reportable education assistance received and processed by CSUF may include but are not limited to scholarships, fellowships, and grants, funds received from employers, outside sponsored awards, third-party billing arrangements, waivers and exemptions, and other cash and non-cash reportable awards. The amount of scholarships or grants for the calendar year (including those not reported by CSUF) may reduce the amount of the education credit you claim for the year. The net amount of such educational assistance is reported to the IRS. Box 6 - Shows adjustments to scholarships or grants for a prior year. This amount may affect the amount of any allowable tuition and fees deduction or education credit that you claimed for the prior year. You may have to file an amended income tax return (IRS Form 1040X) for the prior year. Box 7 - Shows whether the amount in Box 1 includes amounts for an academic period beginning January-March 2019. See IRS Publication 970 for how to report these amounts. Box 8 - Shows whether you are considered to be carrying at least one-half the normal full-time workload for your course of study at the reporting institution that began in 2018. Matriculating degree earning students taking 6 or more units will have this box checked. Students who are taking classes through CSUF University Extended Education in Open University or non-degree earning courses are not deemed to be matriculating students for tax purposes. Box 8 would not be reported as checked for such individuals. Also, Box 8 would not be checked if you were not officially enrolled and taking 6 or more units that occurred for the Spring, Summer, or Fall 2018 semesters. If you are at least a half-time student for at least one academic period that begins during the year, you meet one of the requirements for the American opportunity credit. You do not have to meet the workload requirement to qualify for the lifetime learning credit. See IRS Publication 970 for further clarification. 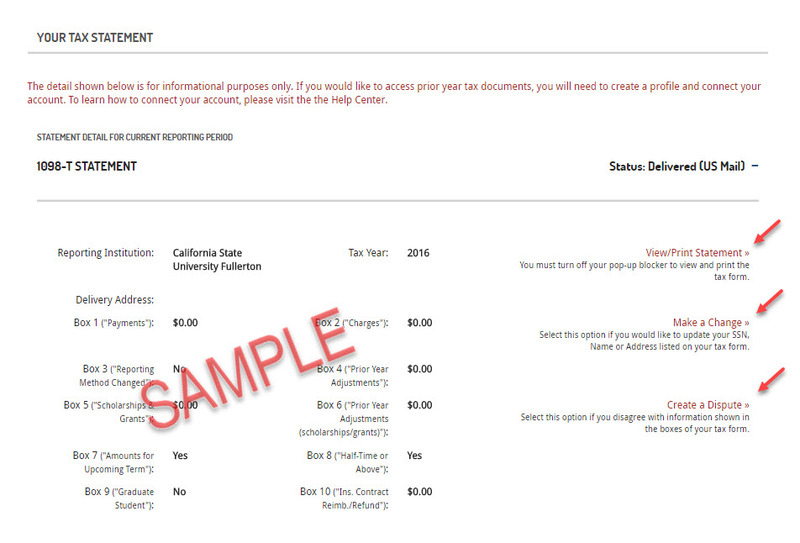 Box 9 - Shows whether you are considered to be enrolled at CSUF in a program leading to a graduate degree, graduate-level certificate, or other recognized graduate-level educational credential any time during the tax calendar year (January 1st to December 31st). Box 10 - Shows the total amount of reimbursements or refunds of qualified tuition and related expenses made by an insurer. Box 10 is blank since CSUF is not an insurer. For tax specific questions, please contact the Internal Revenue Service (IRS) at 1-800-829-1040 or your personal tax advisor for further assistance. California State University, Fullerton does not assist in tax preparation, act as a tax consultant for individuals or entities, provide tax advice, and cannot answer your tax questions. Please consult a tax professional, the IRS, or a financial planner who is proficient with taxation with your tax questions. Each student and/or their parents must determine eligibility for, calculation of, and limitation of the tuition and fees deduction or the education credits (Hope or Lifetime Learning credit). While the university has made every effort to use the most current and accurate data regarding the 2018 tax year form 1098-T reporting, tax laws change frequently, and it is possible that some of the information may no longer be accurate. The information provided is regarding specifically the 2018 tax calendar year and should not be interpreted to apply to past or future tax years. The University disclaims all liability from the mistreatment of information and materials contained in this document. Information regarding immigration, employment, and tax substantial authority is the responsibility of each individual. Please keep in mind that no one from California State University, Fullerton, while in their official role at the university, can act as a tax consultant, give personal, legal, or tax advice, or represent an individual dealing with the Internal Revenue Service (IRS). Thus, any assistance the above information may provide is given as a courtesy to you, and as such, should not be construed in any way as the rendering of legal or tax advice.